This is one of my favorite caramel recipes because you don't have to use a candy thermometer. Total cooking time is about 7 minutes in the microwave (as opposed to 20 + on the stovetop) and after a short chill in the refrigerator, they're ready to be cut and wrapped. This is a great recipe for busy holiday cooks. 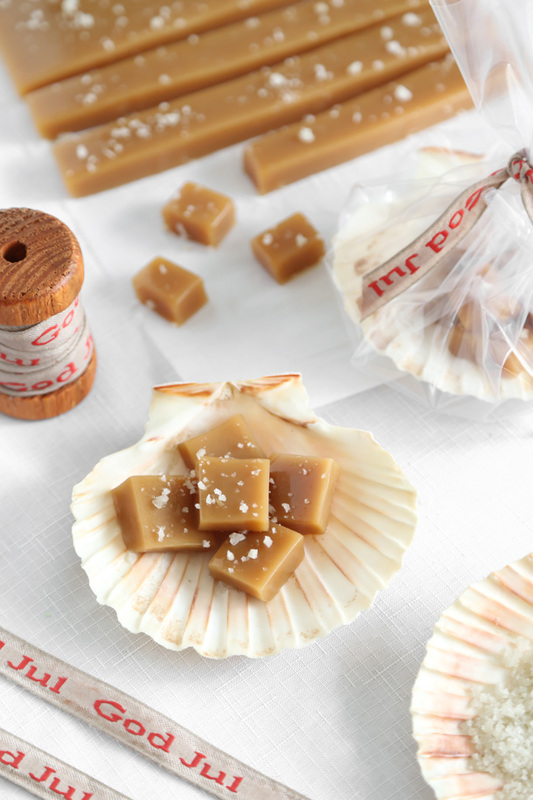 Sea salt is the ultimate complement to this caramel. I use coarse Celtic grey sea salt to finish this candy because it's beautiful and makes the candy taste like it's been kissed by a mermaid. Wrap these up in waxed paper because they are rather soft at room temperature. 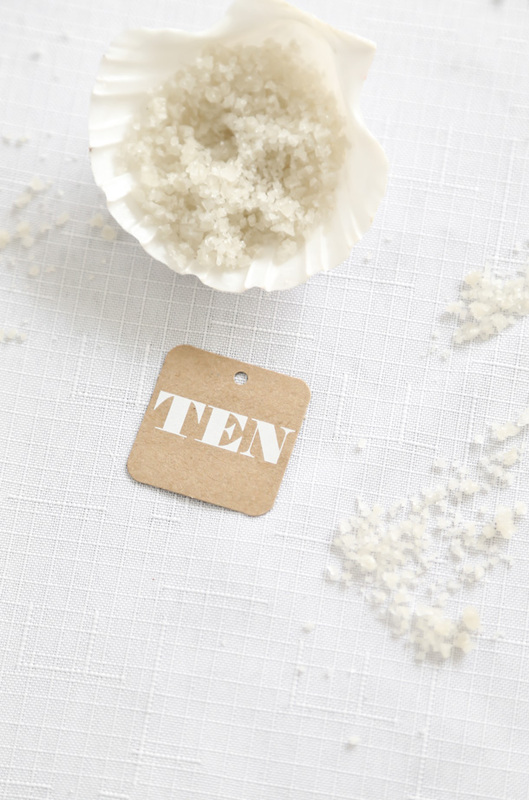 A few pieces wrapped up in a culinary scallop shell makes a beautiful little gift, especially if you opt to use the coarse sea salt. Edit 12/2017: Each year when I post this recipe on social media, it gets a great number of positive reviews and always a couple of fails. This is the nature and gamble of microwave candy-making. I've learned a few things from making this recipe over the past few years and I want to update my findings. 1. If, after all the cooking is done, your batch of caramel looks grainy, then cook it a little longer at 1 minute intervals. "Grainy" meaning you can visibly see sugar grains in the mixture. Ideally you're going for a smooth, thick appearance. 2. If your mixture looks curdled after cooking, then the batch has been over-cooked. However! Even with the curdled appearance the candy should set. "Curdled" meaning lumpy or masses of cooked candy floating in the caramel. I've made several batches like this, and after the candy sets and is cut into pieces, you can't tell it was ever overcooked. 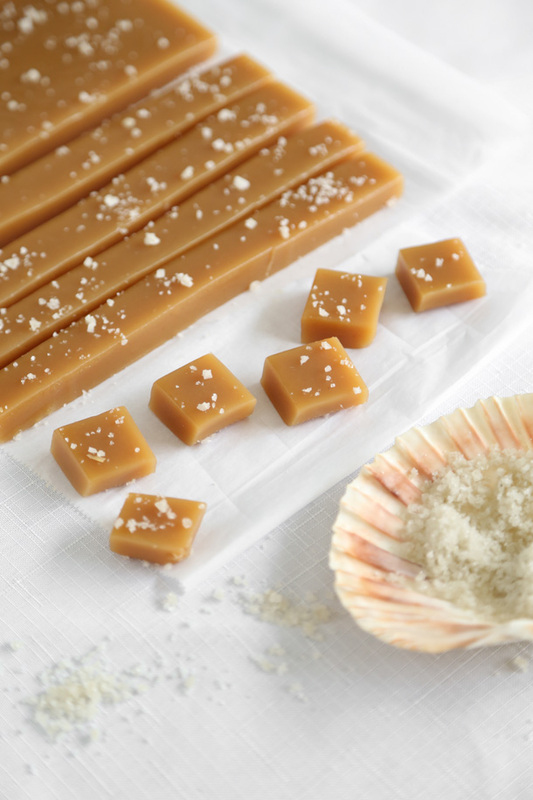 When set, overcooked caramel will be chewier like a manufactured caramel (like those little wrapped Kraft squares). Lightly grease an 8x8 dish with vegetable shortening or butter and line the pan with parchment paper. Cut the paper long enough to overhang the two edges of the pan. In a large microwaveable bowl or 8 cup glass measure, combine the butter, brown sugar and corn syrup. Microwave at 100% power for 2 minutes. Stir mixture well. It will be a little grainy. Microwave for another 2 minutes, stir well. Add 2/3 cup sweetened condensed milk. Microwave for 3 minutes. Watch carefully, it is prone to bubble up at this stage. If it starts to bubble over, open the microwave door intermittently so that the mixture will sink down and not bubble over. Remove from microwave and stir in vanilla extract. Be very careful at this stage, the caramel is extremely hot and sticky! Pour hot caramel into the parchment lined pan. Lightly sprinkle with grey sea salt. Let stand until set, or speed setting with refrigeration. Lift caramel block from pan and cut into individual squares. 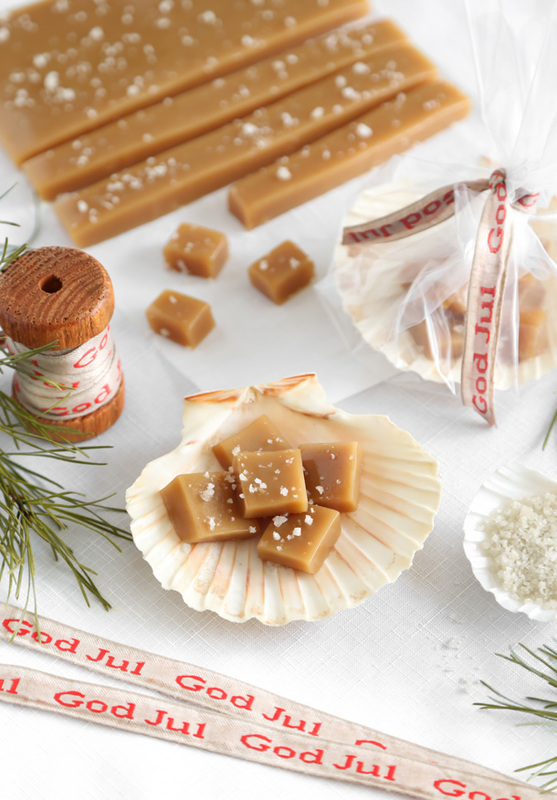 Wrap the caramel pieces in waxed paper squares. Note: this recipe should be made in a standard household microwave. High powered commercial microwaves are not suitable for this recipe. Love the idea of gifting these in the shells! GORGEOUS photos! I can't get enough of your recipes! Keep the party going! Yay! GOD JUL! Hello from Sweden! Love your blog! Yes! But not a huge difference. It will make the caramels slightly darker in color, and just a tad more chewy. Every little detail counts, my goodness, love the sea shells ( I happen to have a huge antique shell collection) idea, absolutely amazing! I'm sorry to hear your caramels didn't set well! Since microwaves can vary power-wise, I suspect your caramels could have cooked a little longer - about 30 to 45 more seconds longer. The caramels are soft at room temperature, I so I usually cut them right out of the refrigerator. They cut neatly cold and wrap well, too. After sitting at room temperature, they are soft, but not so soft that they will stick to the wax wrapper when you unwrap them. Those are just a few visual cues in case you give it another try. I hope this helps! Thank you so much for trying the recipe. I hope you'll try it again with the extended cook time. Thanks Heather for the response. I am planning to try it again. I hope you are right about the extra cooking time. That would be a super easy quick fix. I just finished cutting these up and wrapping in wax paper - they are delicious!! Thank you for the great (and easy!) recipe! Very excited to try these :) Do you recommend light or dark corn syrup? I love these! I dropped my candy thermometer on the floor a few month ago ( :'( ) so I was so happy when I found this recipe and even happier when the caramels turned out great! When I first took the mixture out of the microwave they were kinda... grainy - but I just poured in some of the leftover condensed milk and stirred and that apparently worked! Yummy! Mine didn't set either and I had it in the fridge overnight. I tried cutting with a bench scraper this morning and they were so sticky, it was impossible to get a clean cut. I see above you say it might be that it needed longer in the microwave. Is this something I can fix now or do I need to start fresh? Me again! If I can't fix this batch to make it more...cuttable.. can I salvage it in another way? Maybe melt it down and make it into a sauce or something that I can put in jars for gifts? It does sound like the mixture needed more baking time. Unless you used evaporated milk instead of sweetened condensed milk. That's a common mistake that some people make when making candy. You can salvage it by gently heating it and adding sweetened condensed milk a little at a time until it comes to a saucy consistency. So sorry you had trouble! I meant to say *cooking time* not baking time. This is a keeper and will stay in my recipe collection forever. Mine turned out not quite as smooth looking as yours, but isn't grainy at all. Perhaps my I should have stirred more as it was cooking. Great tasting though, thanks so much. Finally, a caramel candy which does not require testing for the "soft ball stage." My stove top does not heat up high enough to follow a typical caramel recipe. Thank you, Heather. You rock, as usual. took a few seconds off for a powerful microwave: worked out great. Help! I made this recipe 2x last year and had no problems. Since then my microwave died and was repaired. I just attempted to make it again, twice, and both turned out gritting looking. It's not sugar, it almost looks like the sweetened condensed milk curdled. Please help, this is supposed to be christmas gifts for my son's preschool teachers. Sorry to hear that. It's hard to diagnose from here, but it sounds like maybe your microwave isn't as powerful since it was repaired. There is a grainy stage when making this candy. It sounds like it needs to be cooked longer. Cook it at 1 to 2 minute intervals until the graininess disappears, and be sure to stir well between heating. Good luck! any substitute for the corn syrup? Golden syrup, sorghum molasses and honey may be used instead. These three are not as neutral-tasting as corn syrup and will lend their flavors to the caramels. 1. can these be made 2-3 days ahead and kept in the fridge? 2. i do not have access to wax paper! but i have baking paper/parchment paper. can that be used to wrap them up? 3. do you store them in the fridge? Yes, they can be made ahead. I still have some in the refrigerator from Christmas! Parchment paper will work in place of waxed paper. You can store them at room temperature, but they will keep longer if refrigerated.